Home / Fitness and Cycling / Motivation / News / The 260km challenge - "Are you professionals?" The 260km challenge - "Are you professionals?" A ride of 260 kilometres is not an easy challenge. We published the ride on Facebook groups, and invited friends. Not much response to the invitations, and up until the evening before the ride, there were only two confirmed riders. It was a very nice surprise to meet three other riders joining us at the gas station at Avtokomanda before the start. Suddenly we are 5: Aleksandar Dimovski (Thiago), Konstantin Koneski (Kosta), Alex MKD, Aleksandar Stojanovic and me. Wanting to avoid the worst heat, we started the ride at 3AM. Soon we formed a pace line with Thiago and me alternating in the front. Kosta had to be kept in the middle, since he didn't have any lights. We made great time to Rzhanicino and then to Gorno Konjari. At Gorno Konjari we stopped at a closed gas station for a quick breather. Kosta had more surprises - his front brake rotor had been ringing for some time. Alex tried to adjust it, with good success for a fix in the middle of the night in poor light. The sky turned grey as we continued uphill to Krushica. At first Thiago and I pushed a fast tempo, but the rest of the group started falling behind. We needed to pull as a group, so I joined Kosta and we paced up, while Thiago supported the rest of the group. We arrived at the top of the hill just in time for sunrise. Sv. Nikole didn't welcome us for breakfast. Everyone was still sleeping, even the bakery seemed to have been just open. They didn't have anything ready at 6am, and the lady at the bakery definitely wasn't a morning person - so grumpy for a nice morning. We rode out of Sv. Nikole through a nice cool forest, and formed a good pace line for some 10 kilometers. The pace line split as the road shifted to a slight uphill. We supported each others to the next gas station just before Shtip, where we rested, ate and restocked. After the gas station, the road went slightly downhill, so we pushed hard to the next gas station. Afer the final pit-stop to Radovish, we pushed hard over rolling hills, until we reached a sign Radovish - 17 kilometers. Those 17km seemed to last forever, on a constant 2-3% incline. Looking at a long stretch of 2% uphill road is easy, but riding it is difficult and boring. Alex and Kosta actually thought they got lost because the ride on the uphill took so long. We passed a dude on a bicycle wearing a cowboy hat instead of a helmet, riding slowly on a touring bike to Dojran. He looked overheated at 9 AM, despite the huge hat on his head. The way back was weather payback time. We rode into strong headwind which kept with us until we reached Shtip. The 2% downhill helped a bit, but I blessed the fact that I had drop bars the entire 36 kilometres. Thiago maintained the tempo and pulled, while the rest of the group fell back about 5 minutes. As if the wind wasn't enough, the temperature increased rapidly. We kept cool by pouring the water on our jerseys to dry in the hot headwind. Towards Sv. Nikole the headwind got replaced by scorching heat. The Garmin showed 40 degrees centigrade, and there was no shade to hide - just hot asphalt and dry fields around us for another 30 kilometers. The group split again, but Alex, Kosta and Aleksandar passed us when we took a small detour to buy water at a gas station. We reached the group while they were waiting for us at a factory at Sv. Nikole. The security guard at the factory gave us fresh water, and wanted to know how we got there. He was convinced that we had to push our bikes up from Gorno Konjari to Krushica. When we explained that the hill is relatively small and easy, he asked "Are you professionals?" No, but love cycling. We decided to hide from the heat in Sv. Nikole, and have lunch. Our base was at a nice pizza place, and got joined by Petar who rode to Shtip later that morning and was waiting for us for the ride back. After lunch, the lack of sleep crept up on some riders, so Sv. Nikole had two sleeping cyclists in the park. 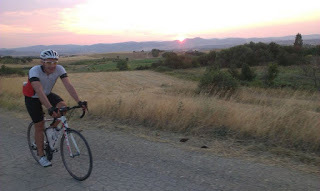 We started towards Skopje at 5PM, and rode in much cooler weather, back over Krushica. The first signs of a coming storm were visible from Gorno Konjari, so we pushed hard to reach Skopje before the storm. In Skopje, we climbed back on our bikes, and rode home. Depending on where the riders live, the tour took us between 250 and 270 kilometres of riding. 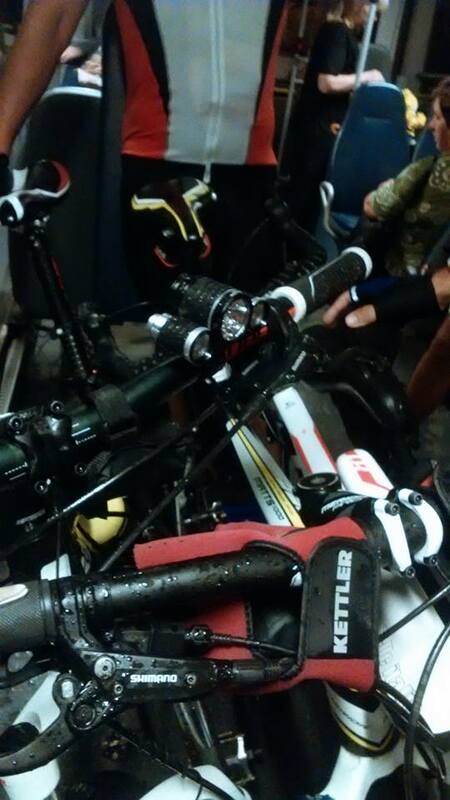 It took nearly 18 hours on the road, with only 10.5 hours of actual cycling too much heat. It's a great ride, but for a colder part of the year.